Gríma, son of Galmód and a Man of Rohan, was the chief counsellor to King Théoden. Clever yet corrupt, he was also a spy for Saruman. He betrayed information important information regarding the affairs of Rohan to his Master, while weakening King Théoden with ill counsel. For his treachery, he had been promised Éowyn as a reward. 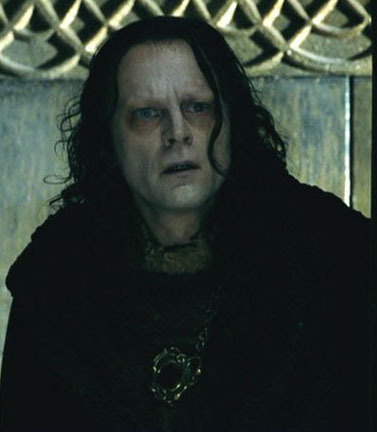 The people of Rohan named him Wormtongue, which Saruman later shortened to Worm. After Gandalf freed the King from Saruman’s grasp, Gríma fled to Isengard, believing that its armies were on the verge of victory. He was captured and imprisoned with Saruman in the Tower of Orthanc. When Saruman was expelled from the Tower, Gríma accompanied him to the Shire, where, in a sudedn fit of rage and despair following much mistreatment and abuse, he murdered him in front of Frodo. As he attempted to flee, he was killed by the Hobbits. Hobbits killed him?! Nice, I gotta read the LOTR books it seems.